Nina Mann ’08, MD Harvard HST ’13 (third from the left going clockwise) advised students to find time to do the things they enjoy and assured them that no one has a perfect linear path, but it all works out in the end. The final event of the series on May 14 featured consultant, venture capitalist, and award-winning comedian Dhaya Lakshminarayanan. The goal of Infinite Careers is to highlight non-linear and diverse career paths and facilitate networking between students and alumni. 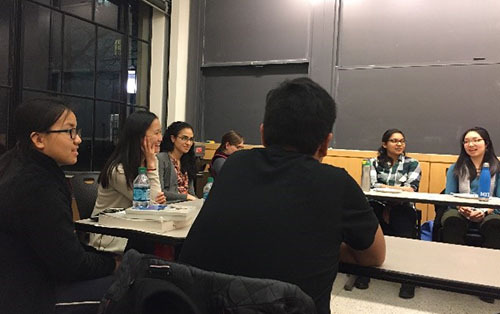 All of the events fostered an intimate setting where up to 13 undergraduate and graduate students connected over a meal and roundtable discussion. In their talks, speakers described how they made academic and professional decisions and discussed the successes and challenges they faced in their careers. Infinite Careers will continue in the fall with a new group of alumni speakers and the team hopes to connect and inspire even more students and alumni!